Bariatric (weight-loss) surgery has recently been touted not just as a way to shed pounds, but also as a potential treatment for Type 2 diabetes. In this excerpt from his book, My Big Fat Greek Diet: How a 467-Pound Physician Hit His Ideal Weight and How You Can Too, Dr. Nicholas Yphantides explains why he believes you should think twice before going under the knife. My heart always goes out to the morbidly obese patients I see who are hospitalized for complications related to their unhealthy condition: severe diabetes, heart failure, and crippling joint disease, to name a few. Inevitably, I pull up a chair and visit with these hurting folks. 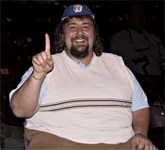 When I sense they need a boost of encouragement, I reach into my Day-Timer and show them a picture of me wedged into a seat at a San Diego Padres game. “Do you recognize that person?” I ask. “No, who’s he?” is the response I generally hear. That’s probably because I had curly, shoulder-length hair atop a torso brimming with 467 pounds. “That was me seven years ago,” I say. How did my surgery go? The supposition that I could only shed so much weight by having a gastric bypass operation (or what the media often calls “stomach stapling”) is largely based on the waves of publicity given to celebrities who have had the surgery and experienced dramatic weight loss. The number of bypass operations has exploded recently, from 23,100 in 1997 to more than 100,000 in 2003, according to the American Society for Metabolic and Bariatric Surgery — nearly a fourfold increase in just six years. I did not have surgery to lose weight — I did it the old-fashioned way, through diet and exercise. I can only be happy that this operation has helped hundreds of thousands of people regain some normalcy in their lives. My joy is tempered, however, by the serious health risks associated with this surgery, and these risks should be carefully considered before altering one of the most delicate areas of the body, the digestive system. Gastric bypass promotes weight loss by surgically restricting food intake and/or interrupting the normal digestive process. Surgeons staple the stomach, or bind it with an adjustable band, to create a small pouch that holds 2 or 3 ounces of food. A normal adult stomach can hold 3 pints of food, or around 24 ounces — the surgery reduces the stomach to one-tenth the size it used to be. It doesn’t take a brain surgeon to figure out that you’re going to feel full very quickly. Eat any more, and you become nauseous. The surgery is generally reserved for morbidly obese individuals who have made numerous, unsuccessful attempts at losing weight through traditional methods: going on diets, changing eating patterns, working with nutritionists, and increasing physical activity. It’s supposed to be the treatment of last resort, but that’s not how it’s being marketed to — or perceived by — the public. I’ve heard of surgeons promoting gastric bypass surgery for people with only 40 or 50 pounds to lose. That’s not a healthy or appropriate choice for these patients. What many people considering gastric bypass don’t know is that you get a “free ride” only for the first year. In other words, it takes your body about a year to recover from the surgery and to get used to the limitations imposed by the surgeon’s knife. Initially, the weight drops off effortlessly, but after a while your body compensates for the changes in your anatomy — suddenly, you stop losing weight. If you fail to practice the good eating and exercise habits that are the basis of every weight-loss regimen, you will regain some of the lost weight. The only way to lose weight and keep it off is to take in fewer calories than you expend. There are no shortcuts to successful weight management! Death. The chances of dying from the surgery are rather high in my book, at around 1 in 200. The risk of dying is dependent on factors such as the kind of surgery and the patient’s medical condition at the time of surgery. There have also been cases of patients dying after binge-eating and rupturing their staples. Nutrient deficiency. Since food bypasses certain key parts of the small intestine, absorption of essential nutrients is interfered with. Nutrient deficiencies can lead to anemia, osteoporosis, and other bone diseases. Dumping syndrome. This involves rapid emptying of the stomach’s contents into the intestines, potentially causing nausea, cramps, weakness, sweating, and lightheadedness. Oh, and don’t forget explosive diarrhea. I’ve met and corresponded with too many people who could not stop overeating despite having a stomach the size of an egg. One woman melted chocolate bars in her microwave and sipped liquefied chocolate all day. Others puréed food that isn’t meant to be puréed: Krispy Kremes, Twinkies, birthday cake. Another woman confessed to me that she ground up pistachio nuts and ate them all afternoon. Although these folks couldn’t eat very much at a time, they were constantly grazing. In each case they regained all the weight they had lost. I understand why people are willing to have the surgery despite these risks — weight loss can dramatically improve quality of life. Nonetheless, I must say that I’m concerned about all the momentum building in favor of surgical intervention. I may be a voice in the wilderness, but I am a visible reminder that dramatic change is possible without surgery. Sure, I know that the chips are stacked against us, that 90% of people who lose weight put it right back on. But obesity is a complicated issue with no easy answers, and stomach stapling should be a last-resort option. Even for those who have the surgery, it still comes down to eating the right foods in the right way. COMMENT: What are your thoughts on bariatric surgery? Have you had it? Are you interested? Dr. Yphantides (“Dr. Nick”) is the appointed cochair of the San Diego County Childhood Obesity Task Force. His Web site is www.healthsteward.com.